Well, this is a bit of a change. A hotel that is respectable but not ridiculous, a venue outside the south-east of England, and contractors in casual dress rather than suits so they are far more relaxed, more informal and more interactive. 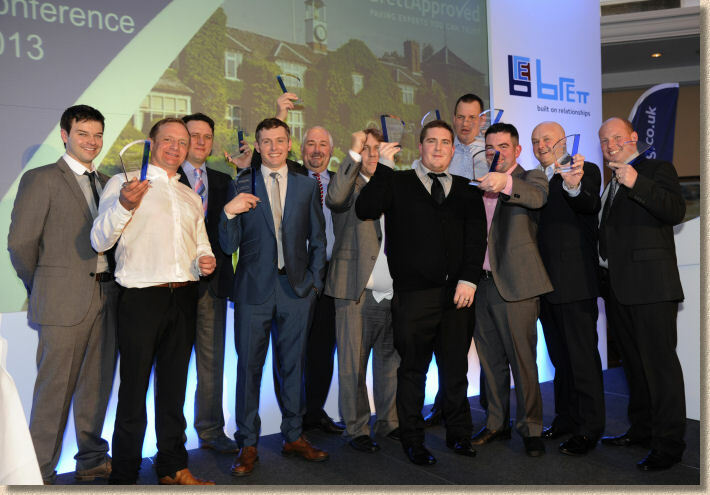 The Brett Approved Installer awards have, over recent years tended towards the ostentatious rather than the accessible, and while some enjoyed a brief taste of the high life, many more felt out of place and uneasy. The world-famous Belfry Golf Saddoe venue carries enough kudos to give the event the necessary sense of occasion without ever straying into the lah-di-dah scale of things. More down to earth than Downton Abbey. And the venue is not the only change. There's a much more business-orientated feel to the afternoon gathering, featuring displays from well-known paving ancillary businesses, such as Resiblock with their range of paving sealants, and Probst with their handling kit. But look around ... there are contractors chatting away with one another rather than looking seriously out-of-their-depth trying to avoid being sucked into another dimension via an overly deep and sumptuous sofa. This is an easy-going, relaxed, informal atmosphere were jeans or chinos are the norm, there's barely a tie to be seen, but everyone is chatting away. There's a display area for new products and some glimpses of products that are in development. The granite flags look very interesting, lovely texture and that unmistakable glint of quartz, and this clever Mobility kerb is guaranteed to be a hit with the patio and driveway installers - it's just one of those things we didn't know we needed until we saw it, but now the possibilities and potential applications are flashing through our minds at a phenomenal pace. The afternoon has a more serious face with the Installer Conference, at which the MD, Alan Smith, gave an overview of the industry from the position of a manufacturer and offered some hazy non-predictions of what they, the manufacturers, are likely to face in the coming year. It's sobering, but not as bleak as many feared. Newly re-appointed as BAI Manager, the bundle of energy and enthusiasm that is Calvin Jackson, delivered a strongly worded, and obviously heartfelt apology for the failures of the scheme since its grand and over-reaching re-launch a couple of years back. It can't have been easy to stand there, before 50 or so of the nation's best contractors, and admit that the scheme had not lived up to some of its promises, that it had let them down, but it did need to be said. There has been a lot of low-level grumbling about the scheme of late. It didn't seem to be delivering what was expected, and quite a few established and respected members had openly questioned whether it was worth the effort, while too many 'badge hunters' had signed up to reap the perceived rewards which using the Brett name could bring. Calvin pulled no punches. In fact, there were some who felt maybe he laid himself and the company too bare, but I think what he did was brave, tough, but very necessary. After the mea culpa, there had to be a line drawn in the concrete beyond which the scheme and the service and the benefits it provides have to be seen to improve. Calvin well and truly marked that line! 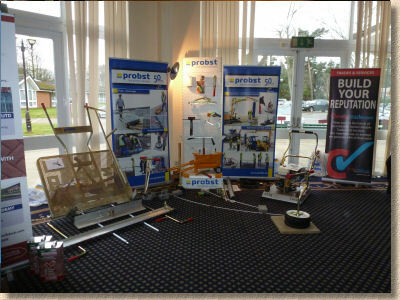 Exhibitors and sponsors on show during afternoon The immediate feedback from the assembled contractors was muted. Is that because they felt all their questions had been answered, or is it the usual not wanting to be the first to speak in public reserve that stymies so much of British life? Talking off-the-record later, the handful of contractors to whom I spoke seemed to share an attitude of giving the scheme the benefit of the doubt for now, the 'let's-see-how-it-goes' approach. 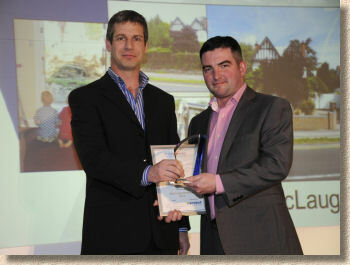 One contractor at our dinner table that evening certainly thought the scheme still had currency and relevance, and was quite happy to continue but I know from brief chats the next morning that at least one contractor has put it 'on probation', although that may be because he feels a certain rival in his locale should not be on the scheme. No doubt, by the time we get to the 2014 awards, we'll have a clearer picture of whether Calvin has managed to re-assert the credibility which the scheme had begun to lose. It's no easy task, but if anyone can, Calvin can! The awards themselves were given out at a fast-paced, no-mucking-about ceremony just before the big dinner, and it all went more-or-less as planned, with the inevitable comedy moments. There was a real sense of appreciation from the contractors for both the runners-up and the winners, with voluble cheering and clapping over and above that necessary to be basically polite. 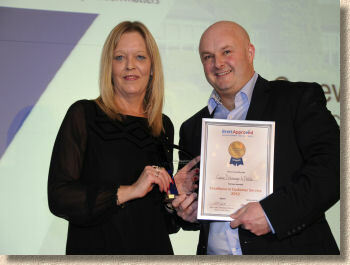 In particular, there was a tangible air of acknowledgement for the Contractors' Choice Award, voted for by the attendees during the afternoon's proceedings. 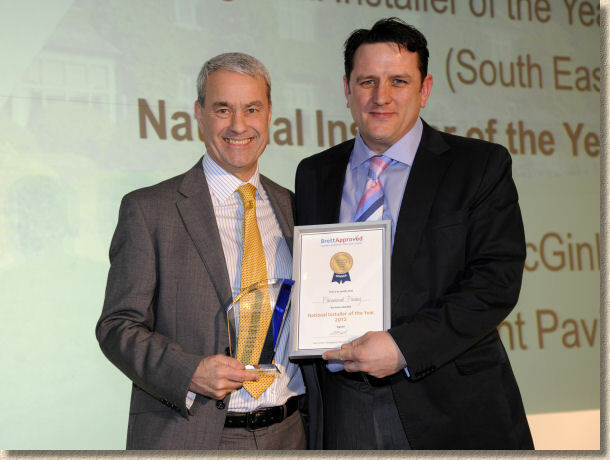 It's one thing to be given an award by a faceless panel of judges, but to be given an award by your peers, by your fellow contractors, well, that really is the pinnacle! Overall, this felt like the most relaxed and informal Brett Awards for some time. The contractors were certainly more at ease, but so were the Brettsters themselves, and that is something that was noticed by more people than just me. The inclusion of supporting companies to provide information and talking points during the afternoon is a marvellous improvement. 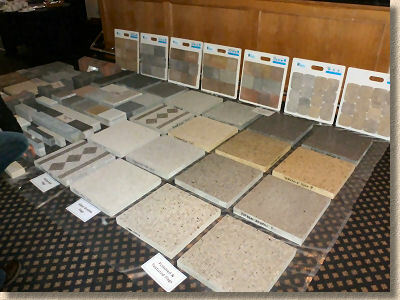 The facility for contractors to see new products is a very welcome move, but needs to be expanded. Larger panels of the new products, and outdoors, if possible, so we can judge in natural daylight rather than rely on artificial indoor lighting. The afternoon 'conference' is a genuinely good idea, but it needs developing to ensure there is input from the contractors and it's not just a series of talking heads from Brett. That obviously requires a deal of pre-planning, to get contractors briefed in advance on discussion topics, or motions for debate, or short videos showing best practice or…..there is so much that could be done with this unique gathering, but it has to be worked out beforehand. 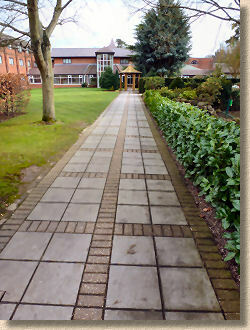 Lovely hotel - dated paving! Now that the contractors have an understanding of this new format, maybe next year it will really soar. There's a sense of the potential, but it needs to be nurtured, and in the right hands, this could actually become the most relevant and important awards bash on the calendar, certainly in terms of what ALL attendees learn and experience, if not in terms of sheer numbers. Congratulations to all the runners-up, who missed out on a mention here due to limitations of time and space, and to all the winners who thoroughly deserve the recognition that must now surely come their way. 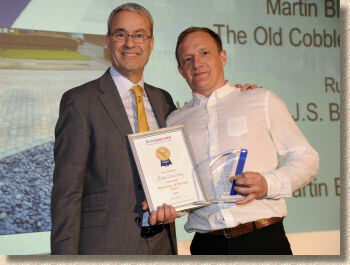 But I can only finish with a big slap on the back to the real standout contractor and deserving winner of National Contractor of the Year. 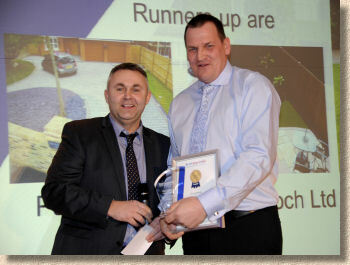 To win one award is impressive, but to walk away with three of the top notch prizes, plus a runners-up place in the Best Large Patio category is truly exceptional - well done to John McGinlay and all at Paramount Paving.